I have a table that has several nullable integer columns. This is undesirable for several reasons, so I am looking to update all nulls to 0 and then set these columns to NOT NULL. Aside from changing nulls to 0, data must be preserved. I am looking for the specific SQL syntax to alter a column (call it ColumnA) to "not null". Assume the data has been updated to not contain nulls. Update the table so that there are no nulls in the column. Otherwise abatichev's answer seemed good. You can't repeat the alter - it complains (at least in SQL Developer) that the column is already not null. in addition, with this, you can also add columns, not just alter it. 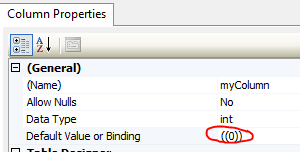 It updates to the default value (0) in this example, if the value was null. Change VARCHAR(200) to your datatype, and optionally change the default value. If you don't have a default value you're going to have a problem making this change, as default would be null creating a conflict. Making column not null and adding default can also be done in the SSMS GUI. You can change the definition of existing DB column using following sql. Not the answer you're looking for? Browse other questions tagged sql-server tsql null alter-table alter-column or ask your own question. How to add a not null to an already existing column in SQL Server? Alter a Column with migration file? How do I change a column from null to not null when an index depends on that column without recreating the index?